CLICK HERE TO LEARN MORE ABOUT SMARTER TAX PREPARATION. 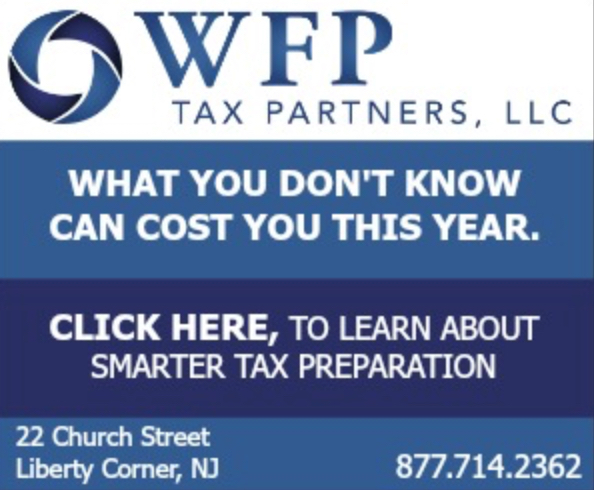 WFP Tax Partners provides CPA tax planning, preparation and filing services for our clients. Our clients receive proactive advice on tax reduction strategies based on income, expenses, individual needs, and goals. Proactive tax planning allows our clients the opportunity to minimize tax burdens and build a solid foundation of tax reduction strategies that can result in years of tax savings. Our Firm Headquartered at 22 Church Street, Box 60 in the historic Liberty Corner district of Basking Ridge, New Jersey. We serve clients nationwide. Please, feel free to browse our website to see the services we offer as well as the many helpful resources we provide. When you are ready to learn more about what we can do for you, we encourage you to contact us. 1-877-714-2362 or email us at info@wfp-taxes.com.